NonoCube comes from http://www.graycode.com/contact.htm and is a totally free puzzle app. 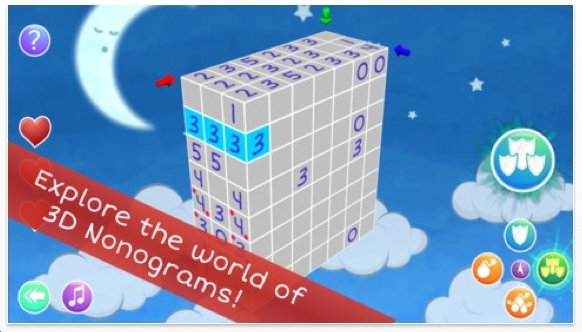 Are you familiar with Nonogram? It's a 2-dimensional game where you have to color in some numbers on a grid via vertical/horizontal clues. They're fun, but I've never actively sought them out. 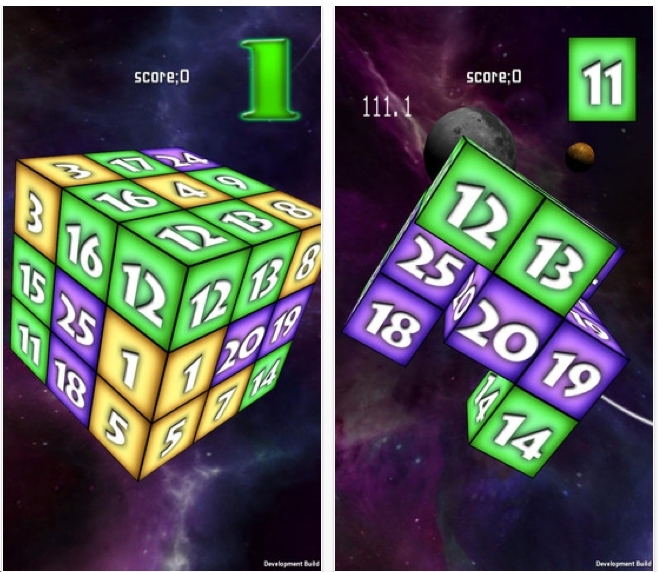 NonoCube is essentially the same idea, but in 3 dimensions. You must create a shape. To do that, you will 'shield' the boxes you want. And 'bomb away' the boxes you do not. What about the boxes inside that you cannot access? See the red, green & blue arrows? You can temporarily hide some layers to get to the interior. The graphics are outstanding. The controls are very good too. The puzzles are pure logic. Not very hard, but that's okay. I've done 57 of the 60 'normal' levels. Platinum levels are available too. But they're not ready. NonoCube is a winner. Download it. 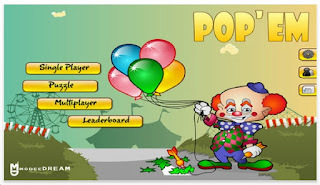 Francois Dubuc recently contacted me about his new game app: Pop 'Em http://www.mobeedream.com/. There is a puzzle mode. Tap on 2 of the same figures and they will disappear. The object is to clear the board using the given number of moves. It's not very hard and we've seen this type of game before. Still, I think they're fun. Young Puzzle Genius: read the story, then play his game. 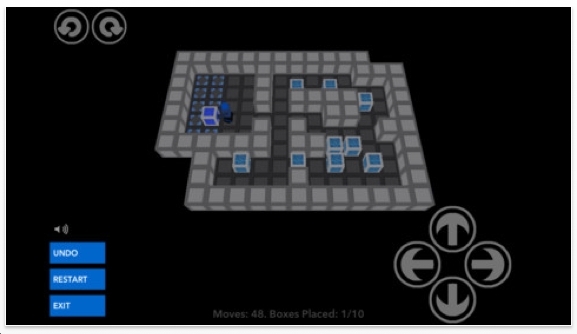 http://www.kotaku.com.au/2012/11/meet-the-boy-who-wants-to-change-your-life/ Very interesting young man who's only 19.
http://www.kongregate.com/games/wanderlands/impasse Play his game! 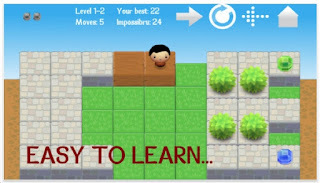 About a year ago - maybe it was 2 years ago - somebody ripped him off and published an iphone game called Deadlocked. Damn good game. Short, brilliant, and fun. What more could you ask for? 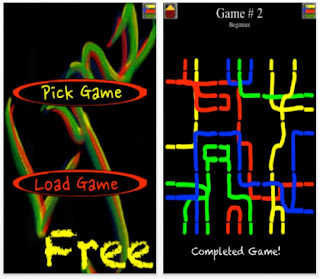 Here's the latest ripoff of ThinkFun's Rush Hour. 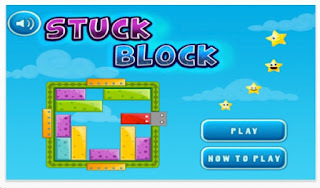 Stuck Block is it. It's a shame that so many puzzle app developers keep using Rush Hour. A few have used it and made modification, which is okay. Hyper Snake is a tilting dexterity puzzle app game that was recently offered for free. 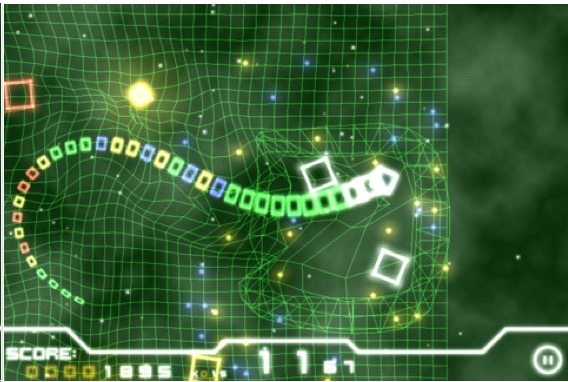 The object is to guide your snake onto squares to absorb them and get larger. The head of your snake must never touch its tail. Look at the second diagram. Your snake is so large. How can it get that red square? There are 6 different versions of this game. I like the Classic mode. 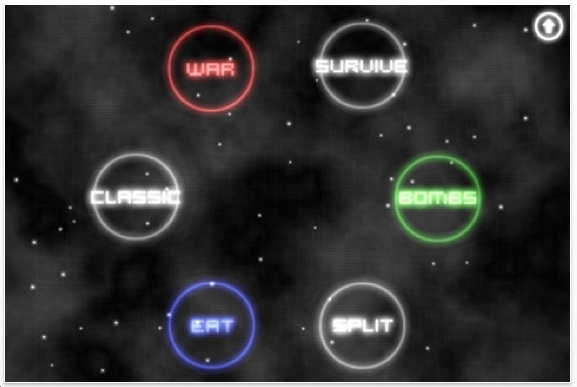 I also like the Split mode which reminds me of Asteroids. If this game is still free, you should download it. Even if it costs $.99, it's fun. 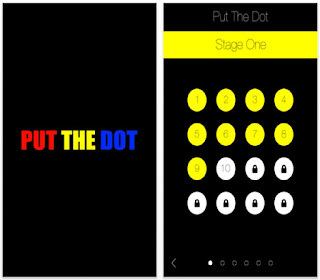 Put the Dot is a puzzle app that I do not want to play. And yet, I've played it for a couple of hours. The object is to put 1 dot on the board. It will explode, like a bomb from the old video game Missile Command. 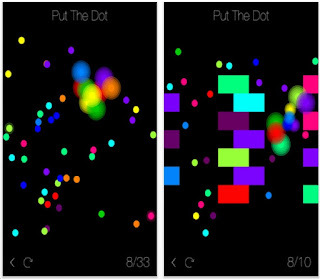 Whatever dots crash into it, will also explode. I've gone through the first 68 or so levels. 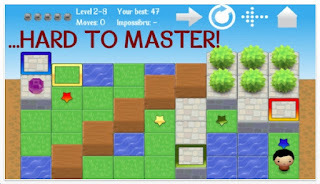 Some levels are quite easy, others are super hard. Some levels require you to actually think. On other levels, it's mostly luck. Although, when you're successful, you may convince yourself that it was all logic, when it was 15% logic. The program did crash once. I think it occurred when it switched to an ad and I rapidly tried to close that window. Still, I do recommend that you try this. The concept is not new. But the implementation is very good. This Mechanical Puzzle Correspondent is reporting on the world's greatest mechanical puzzle: The Lotus Table by Kagen Schaefer. It's not the hardest. But for a variety of reasons: craftsmanship, design, size and all around coolness, it is simply a masterpiece that will be in a museum one day. I have some bad news: you cannot purchase this puzzle because they are all sold out. However, you can buy my article on it. Strangely, the August issue is on sale now. Don't ask me why. Suffice it to say, the September issue will soon replace it. So hurry. GAMES Magazine can be purchased at Target, Barnes & Noble and any other place that sells a wide variety of magazines. Go Round is a point scoring puzzle app. You must score enough points to move to the next level. This is a difficult game to describe. The object is to make groups of 3 on the concentric rings. 3 matching colors on the outer ring will shoot inward to become 1 on the next inner ring. You can have a chain reaction. But I'm not sure about the exact point scoring system. This much I know: promoting a color from the outermost ring to the innermost will yield a lot of points. I have not figured out the details. Grouping 4 gets more points than 3. 'Yes, I guarantee all 100 levels can be solved without using a single booster, bomb or otherwise. I have completed all the levels without boosters, and one of our testers completed the entire game with only using a few wildcards in the last dozen or so levels, but no bombs. It took each of us about 25-30 hours to finish, and involved lots of level replays. 1. 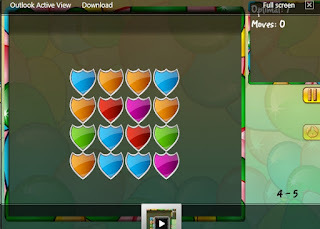 Combo moves, where you cause a piece to be promoted through several rings in a single move, are worth a lot of points. 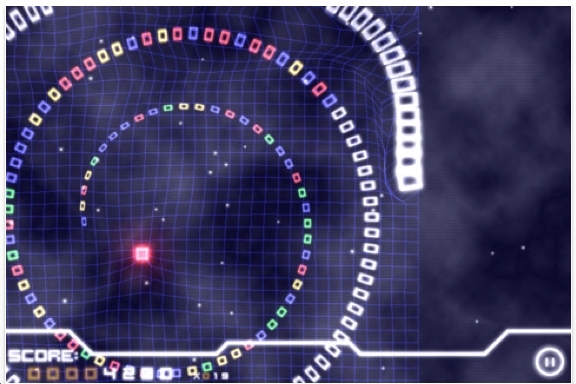 The more rings it moves through at once, the more points you get as a bonus. 2. A promoted piece accumulates value throughout its lifespan. If you promote a piece, not only do you get a score for that, the piece also gets a multiplier attached to it, so the next time it is promoted, the resulting score is higher. This is why the outermost ring is said to contain the most valuable pieces. 3. 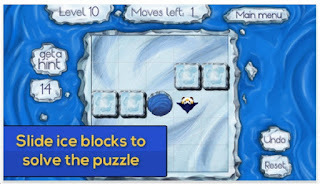 The game keeps track of how many pieces weren't removed from a ring, when the ring disappears. The more pieces you leave behind, the less each move you make after that will be worth. So if you leave a lot of pieces behind in ring one, it will greatly decrease the score of all your moves after that. 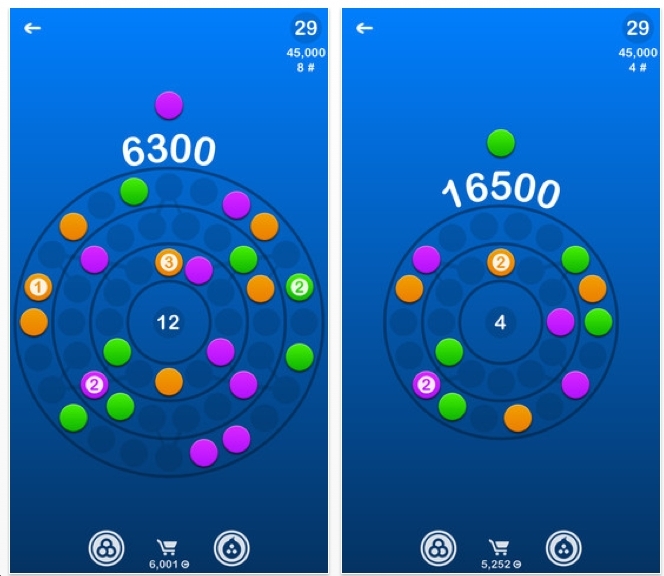 This is to discourage players from simply trying to increase their score by creating matches in the centermost ring, rather than actually trying to solve the round's piece layout. 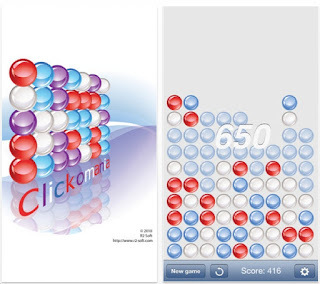 Essentially, you are rewarded for strategic play, rather than simple color matching. However, the game is very much designed for you not to try and remove all the pieces from the rings, so definitely do not obsess over leaving a few behind. It's merely meant as a way to keep people from cheating. 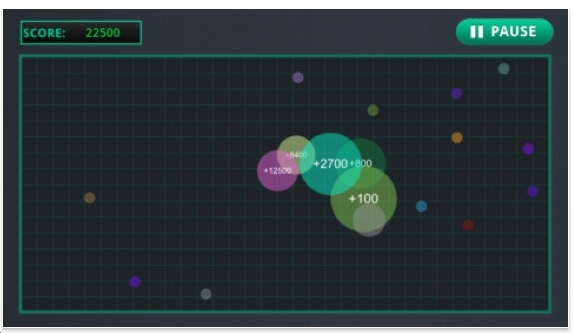 During normal strategic gameplay, it is entirely possible to achieve all the minimum goal scores. There are 100 levels. I've done all 100! But I must confess that I did use my points to buy wildcards from time to time. And some bombs. (Note to National Security Agency: these are not real bombs; they are for a game.) 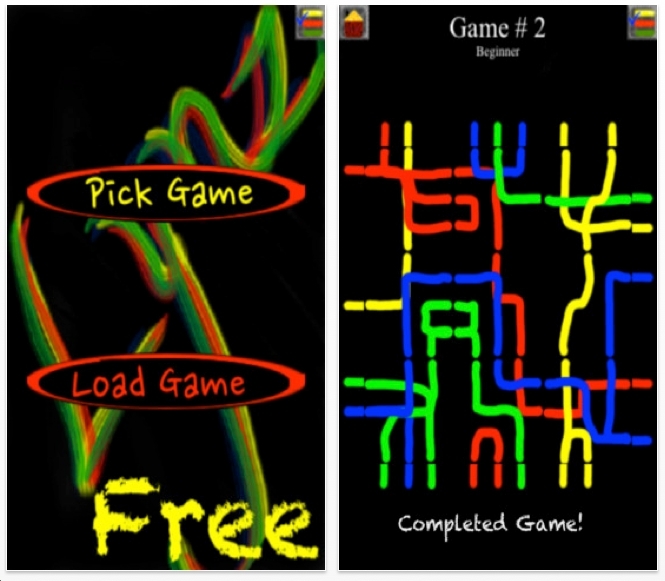 I really like this game and think it has the potential to make the prestigious list of Best Puzzle Apps of 2013. But you'll have to wait until December 31. Sorry. Download it! And make sure you budget at least a 5 evenings to complete it. If something looks like a Rubik's Cube, I'm interested. TouchNumber 3D has nothing to do with Rubik's Cube. The object is to tap on the numbers from 0 - 26 as quickly as possible. That's it. #0-8 are yellow, the next set is green, then purple. So that helps. It's fun for maybe 5 minutes. 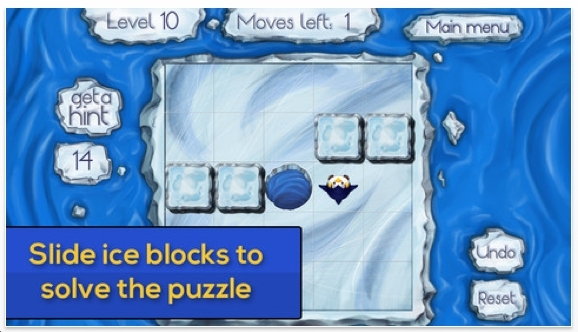 It will not make the List of Best Puzzle Apps of 2013. Not a chance! But I like the graphics. sorry for not posting much this week. I've been swamped with my day job and other projects. It's hard to keep up with the 200 plus new puzzles every week. Especially if you're hooked on one. Which I am. More about that next week. 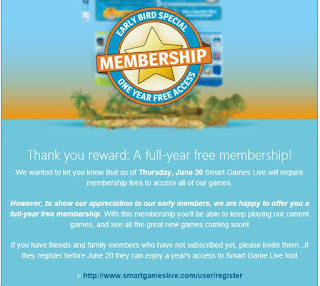 http://www.smartgameslive.com/ You absolutely, positively, must go to this site and register for their online games. I've told Raf Peters that he should make them all available for the App Store. 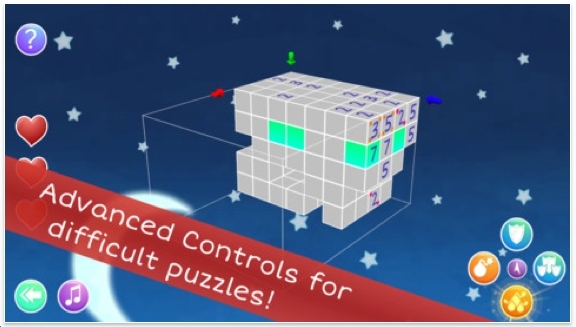 In the meantime, they have 36 puzzle games. At the very least, play Anti-Virus. 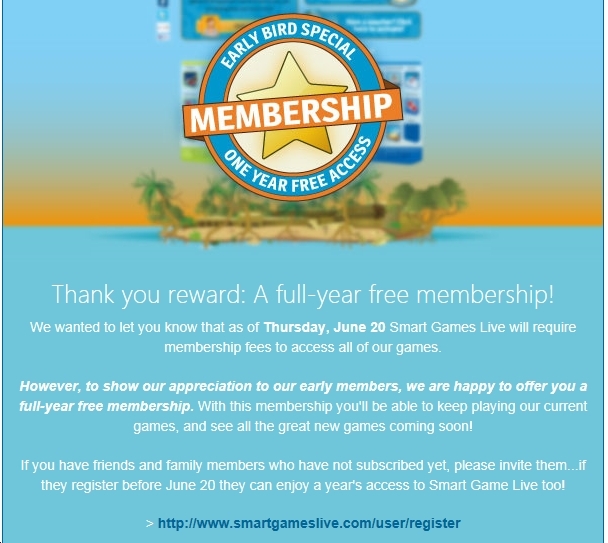 Sign up now while it's free! 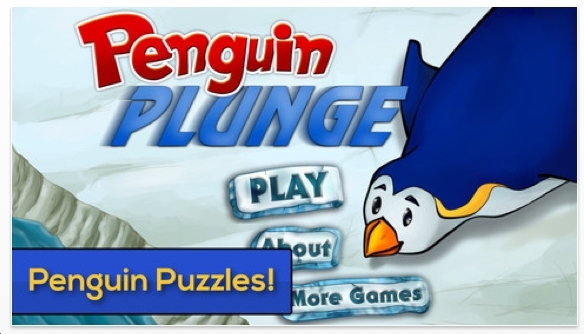 Penguin Plunge: Stuck in Antarctica is exactly like Lunar Lockout from ThinkFun. 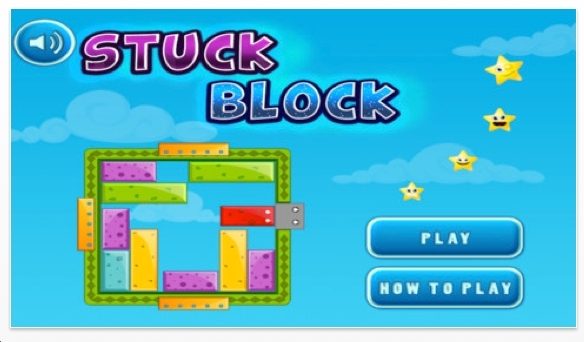 ThinkFun has been getting ripped off too many times. Too often, somebody comes out with a version of Rush Hour. This is the second ripoff of Lunar Lockout. Nob Yoshigahara was the creative force behind Lunar Lockout. I recall sitting on the side during an International Puzzle Party in Tokyo and he was performing a magic trick. He told me that it was 'so simple'. But I don't think anybody could figure it out. He was a character. 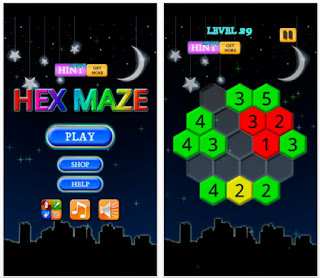 Hex Maze comes from Xia Pei Ming. It's not a maze. There's nothing maze-y about it! I suspect that the author used 'maze' as a synonym for puzzle. Rearrange the tiles so that each one has the correct number of tiles surrounding it. For example, do you see the yellow 2? It's good because it's next to 2 tiles. Red means that too many tiles are touching it. Green - not enough tiles. We've seen this type of puzzle many times before with a rectangular grid. So it's nice to see this. Also, the graphics are good. In terms of 'puzzle fun' it's not quite there. Still, it's free, so give it a chance. LynzFree comes from Matthew Little. It is an edge-matching puzzle with funky colors. 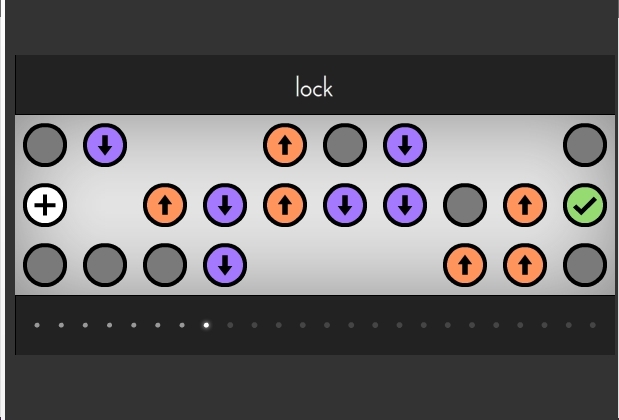 There are 3 levels: beginner, intermediate and advanced. 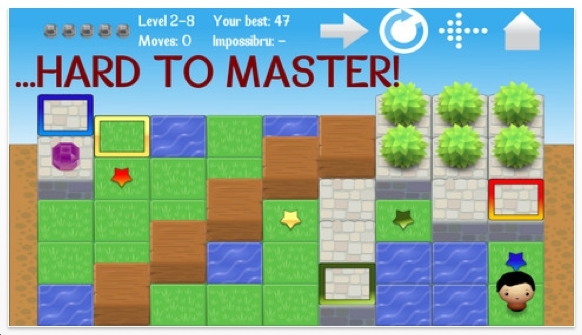 In the beginner levels: trade the 9 tiles in a 3x3 grid. 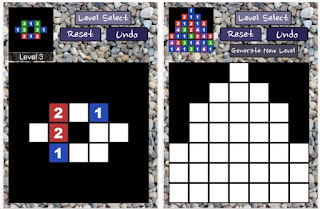 In the intermediate level: same as beginner, but some tiles can also rotate. Advanced levels: they're not ready. I've been doing edge-matching puzzles for many years. It's not something I actively seek out. However, I do like these graphics. Right now I've done 2 of the beginner and 2 of the intermediate levels. 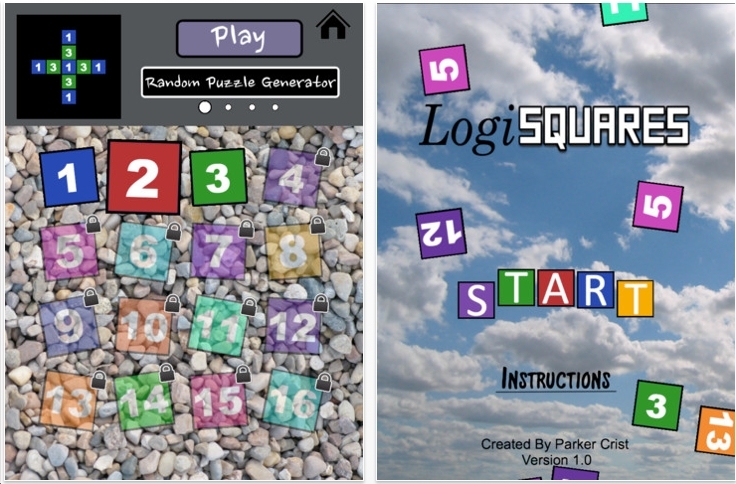 It's a free puzzle app game. Kids will like this. Push Around comes from Gary Rosenzweig. 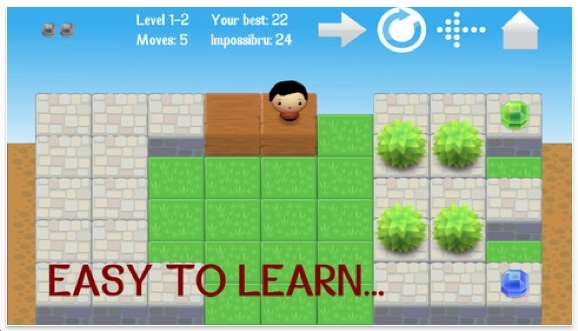 It's a Sokoban game where the object is to push the blocks onto targets. 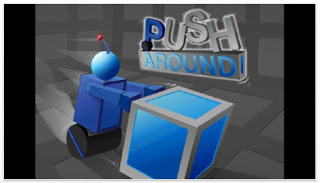 Push Around has 12 free levels. Old school graphics. I did # 1 & 12. I like the fact that you can rotate the board. $2.99 for the next 88 levels. 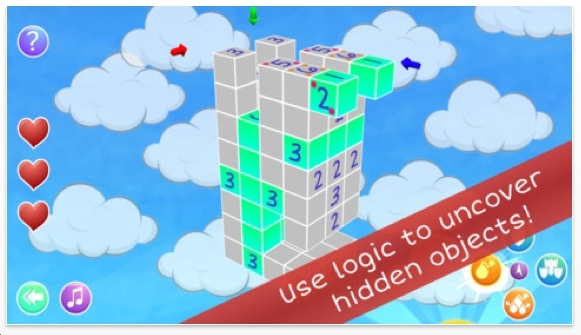 Impossibru's Blockoban is a set of very clever puzzles. The object is to get your man to pick up the jewels. Slide your man -tilt maze style - all the way to the end. Your man cannot go over a bush. As for the grass & water, you will need to slide platforms. 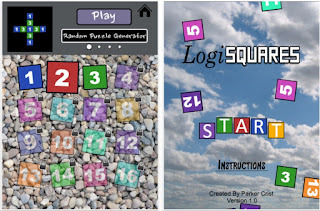 Chain Reaction Saga is a free puzzle app game. The scenario: a grid has balls moving in all directions, and bouncing off the walls. You must place one large circle anywhere on the board to capture the bouncing balls. However, you have a limited amount of time to do this. 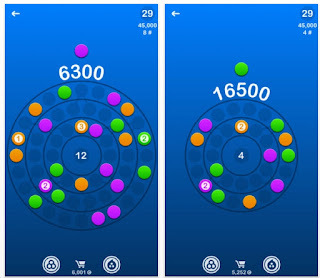 I was able to do solve level 4 which required me to capture 6 out of the 11 balls. Tough! Fun? Not as much as it could be. The graphics really need to be spiced up. 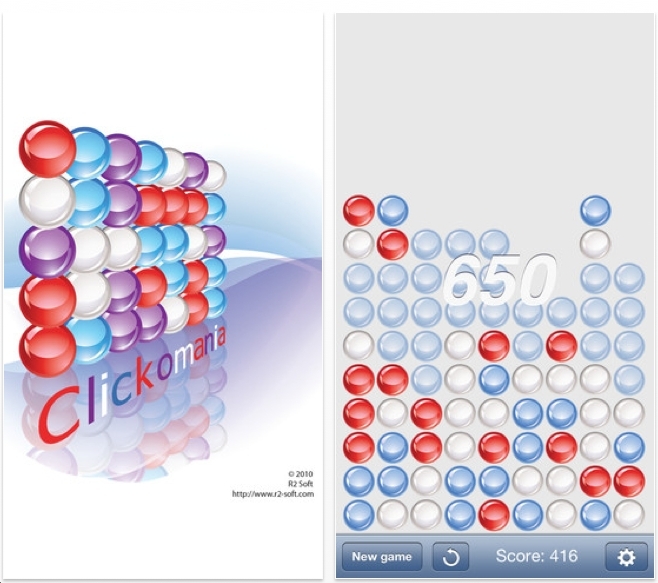 Clickomania is a clone of so many other puzzles: click on a group of red marbles and they will disappear and the other marbles fall down. The final objective is to clear the board. 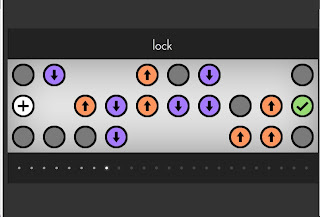 Anybody know how many versions of this exist on the App Store?